↑ Buonassisi, recipe #877 "Al Pien... si tratta di gnocchi, delicatissimi, secondo un'antica ricetta mantovana..."
↑ Theisen, K. "World Potato Atlas: China - History and Overview". International Potato Center. ↑ Alessandrini, Laura. "Influence of processing conditions on quality aspects of potato-based fresh pasta." (2010). ↑ Traditions et Cuisine du pays Niçois, Recettes Niçoises de nos Grands-Mères. Myriam GARNERONE, Editions CPE. June 2008. Davidson, Alan. The Oxford Companion to Food, s.v. 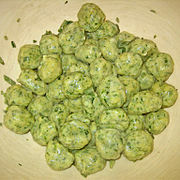 gnocchi. Jenkins, Nancy Harmon. Flavors of Tuscany. 1998. GARNERONE, Myriam. "Traditions et Cuisine du pays niçois, Recettes Niçoises de nos Grands-Mères". 2008.